Nautical flags represent letters of the alphabet as well as 'signals' such as coming into port, carrying hazardous cargo, etc. 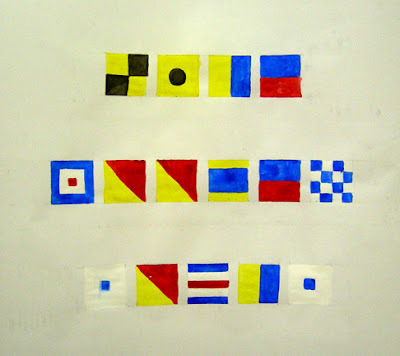 I'm working on a series of paintings using these flags. I have a set of quotes from people and a second set that are a conversation between two lovers. 'Like wooden socks' - quote from Gijs Bakker of Droog design who was in Ann Arbor last Wed/Thursday giving a lecture. This quote was in response to an absurd question asked after his lecture about car design. 'Had we lived' - quote that begins Robert Falcon Scott's final diary entry on his journey back to basecamp after not being the first to the South Pole. I am working on a few sculptures featuring parts of his final statement, which was later morse code sent to England and broadcast all over the country. These paintings are going to be turned into actual flags strung across a space. I am still deciding whether they will be inside or outside- what type of landscape I want them to have.